1. Why is it called Minion? Because, like a good little minion, it does what you tell it to do and takes care of all the work for you. 2. What Operating Systems does it work on? It works on Windows and Mac. Linux support is coming. 3. Will it auto update on me? There is an option for you to have it auto-update your AddOns for you, but this option is off by default. 4. Is there a “premium” version? No. There is one version of it for everyone. We have some features coming that will only be available to premium members, but the core functionality of the updater will remain available for everyone. 5. This means it isn’t “limited” in any way? That is correct. There is an “Update all” button that works for everyone, whether you are a Premium Member on our sites or not, and there isn't any throttling of download speed either. 6. Is there a way to ignore an addon? 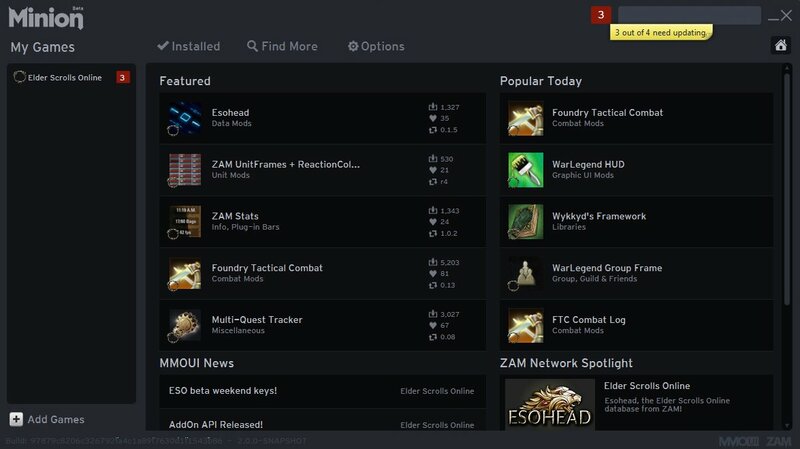 What about getting more information about an addon? Yes. 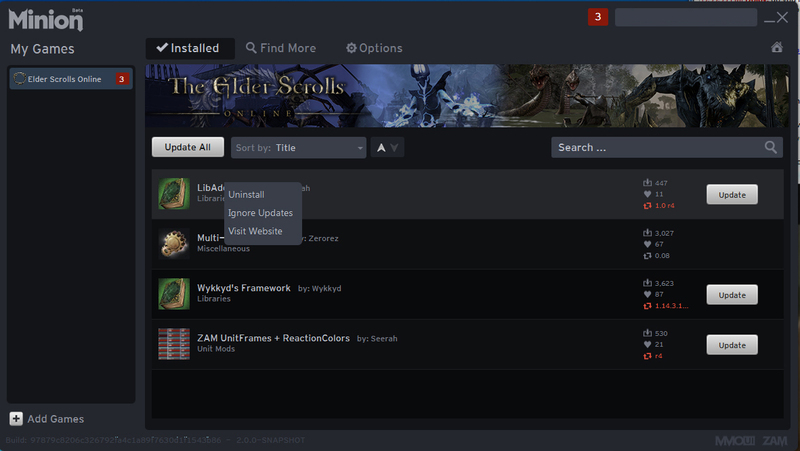 There is a right-click menu on the installed tab that will allow you to uninstall an addon, ignore updates for it, or go to the addon’s page on the site to get more information about it. 7. Will I be able to search your site and install addons directly from the program? Yes you will. You can see in the screenshots that there is a “Find More” tab. 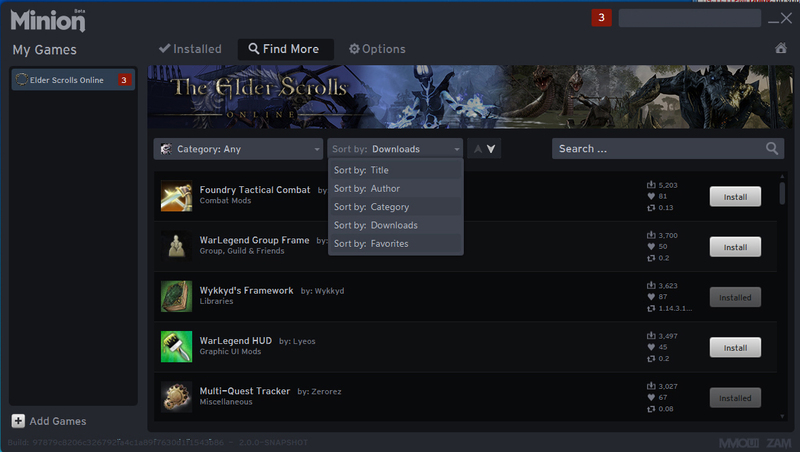 Clicking that tab will give you a list of all of the addons on the site. You will have options to only look in certain download categories, or sort the list by name or number of downloads, etc. 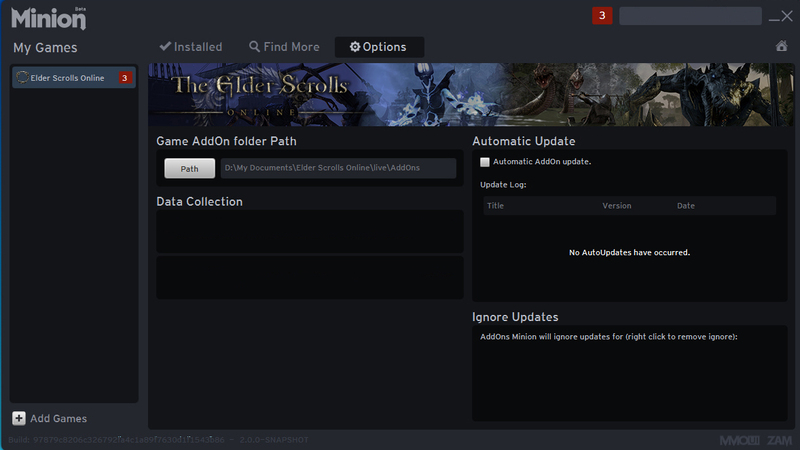 Right clicking on an addon will give you the option to go to the addon’s download page on the site, to get more information about it. 8. Will it work on your other addon sites? It will work for all of our other sites in the future. At present it only works for Esoui. 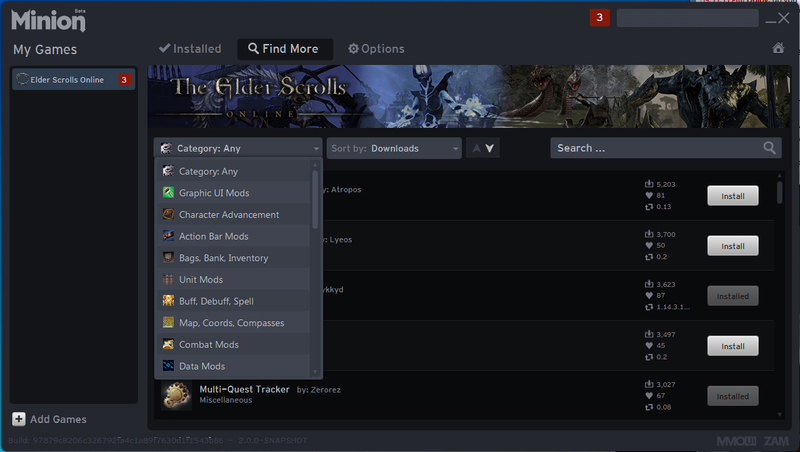 We didn't want to delay its release until we had it set up for our other sites, but instead we wanted to get it pushed out for you guys to play around with during this final ESO beta weekend. 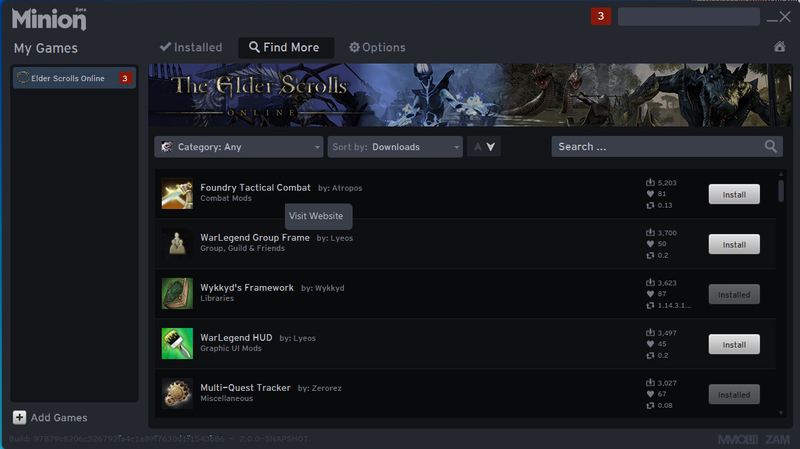 This way you will have it all set up ready to go when ESO goes live. 9. Will it have the ability to upload my gaming data to a database site, the way some other clients do? Yes, but it isn't available just yet. 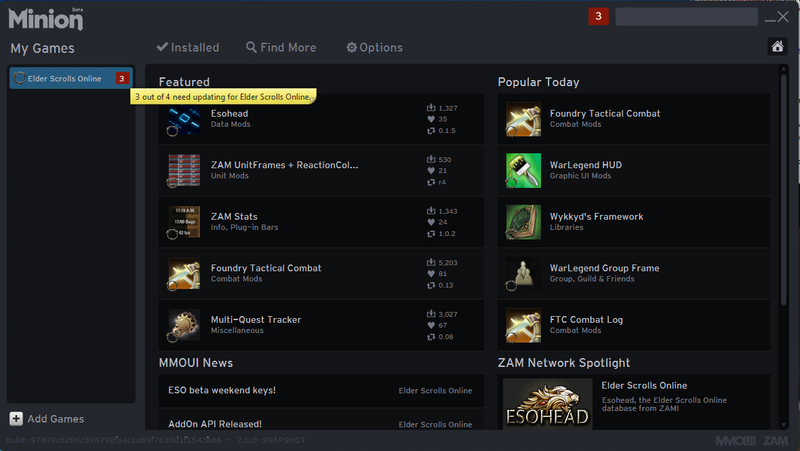 If you choose to enable it, once it is available, it will allow you to upload your gaming data to your favorite Zam database site (like Esohead, Wowhead, etc.) using the same program. 10. What are those numbers in red at the top right corner and beside the game name in the left column? 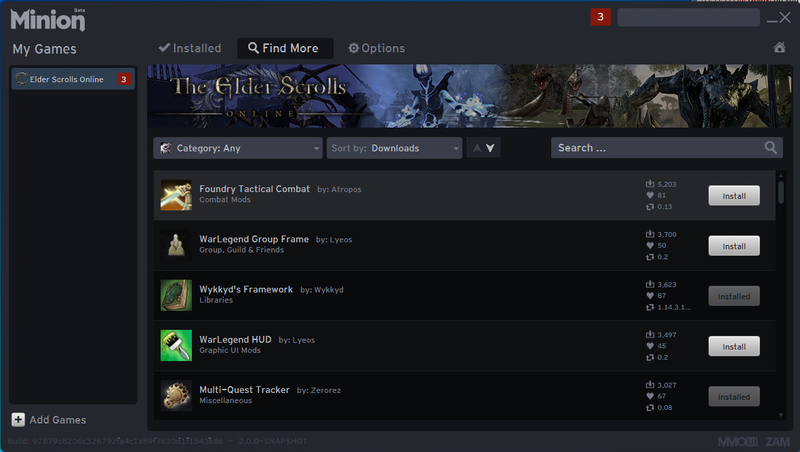 The number in the top right corner is the total number of addons that have updates across all of your games (once we have it set up for the rest of our sites). 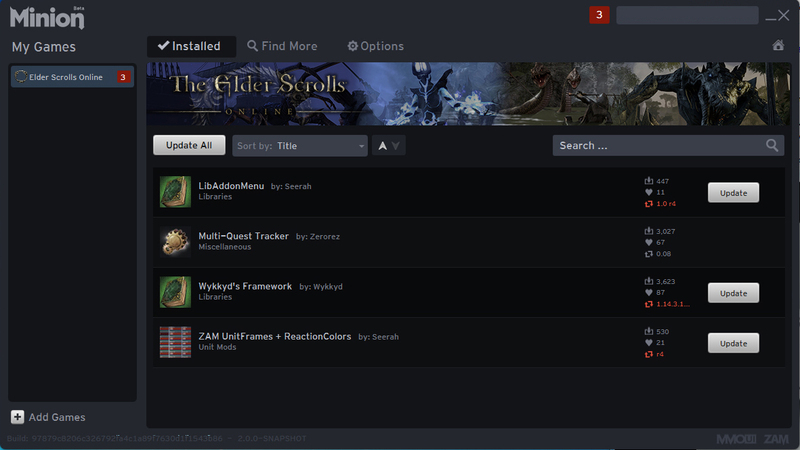 The number beside the game name in the left column are the number of addons that have updates for that specific game installation. Minion will now auto refresh its data every hour. Enable auto-update under options and it will automatically update your AddOns as they are released. Last edited by Cairenn : 07/09/14 at 02:12 PM.